This past Saturday was National Estuaries Day, an event that is celebrated throughout the United States. 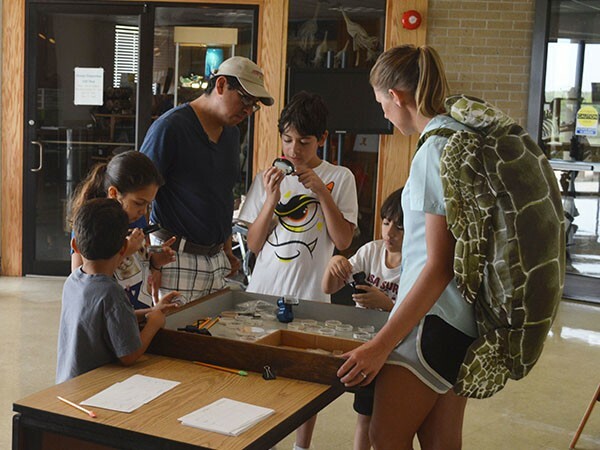 We are fortunate to have our very own [Mission-Aransas] National Estuarine Research Reserve located right here to help celebrate and commemorate what special places our estuaries are. This year visitors participated in several games and activities that imparted why estuaries are important and how they can also be fun. Stay tuned for next year’s event – Saturday September 24, 2016. The cabinet of curiosities sparks imagination. Credit: Nicole Pringle. A young scientist learns that sea beans are true sailors of the sea. Credit: Nicole Pringle. A giant red hermit crab is one of our estuaries' unique animals and mascots. Credit: Nicole Pringle. Visitors are wild about estuaries. Credit: Nicole Pringle.